recorded on the Aircraft Engine Record card. An engine card is shown in figure 7-7. For the most part, the card is self-explanatory. The blocks are numbered to correspond to items of information reported on ETRs. 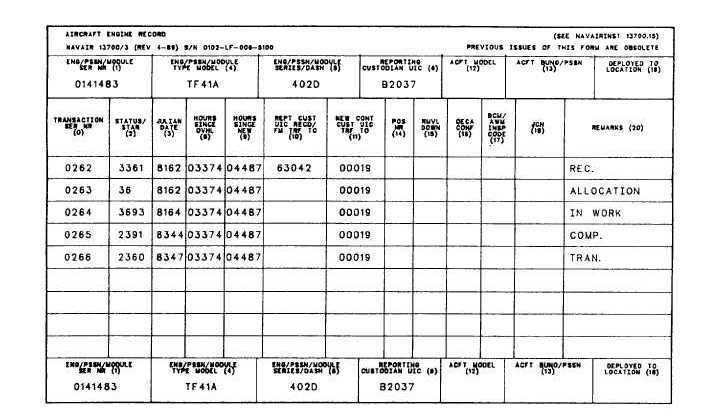 An understanding of data elements and ETRs will clarify the entries made on the Aircraft Engine Record card. There are numerous other situations that require an ETR; however, those listed above are used most often. The preparation of an ETR is a relatively simple (but important) task. NAVAIRINST 13700.15, as well as instructions issued by the controlling custodians, contain guidelines and examples that cover almost all anticipated engine transactions. These instructions also provide detailed information on status code and STAR code applications and required data elements. Refer to the matrices listed in figures 7-8 and 7-9 for more information on required data elements for specific status/STAR code combinations. Figure 7-7. - Aircraft Engine Record card.